Capital City Men's Chorus – The Capital City Men’s Chorus is gay men and their allies raising voices in song to change minds, transform lives, and build community. Our season will conclude at UT’s Bates Recital Hall with the Texas premiere of UNBREAKABLE, a groundbreaking new work by Tony Award-nominated composer Andrew Lippa (I Am Harvey Milk, The Addams Family, Big Fish, The Wild Party). This new musical presents an historical arc to the experiences of LGBTQ people over the last 12 decades, illuminated by four characters drawn from real-life stories from throughout LGBTQ history. These stories include: Jane Addams, the first woman to win a Nobel Peace Prize in 1931 and an open lesbian activist; Lem Billings, JFK’s best friend, a closeted gay man seated at the side of the most powerful man on Earth; Sylvia Rivera and the transgender community she nurtured; and AIDS and its impact on a generation. The work weaves together the themes of awareness and activism and seeks to illuminate decades of setbacks and progress in the United States. 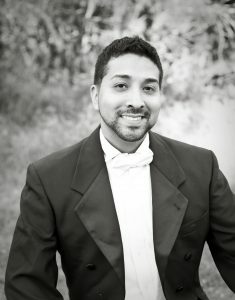 Dr. Daniel Arredondo, II attended Westminster Choir College of Rider University and earned his undergraduate degree in music education with a minor in dance. He holds a master’s degree in choral conducting from Texas State University and also completed his doctor of musical art in choral conducting at the University of Texas at Austin. While at UT, he served as the director of the official show choir, The Longhorn Singers. Expanding his education in a global respect, he traveled to Hungary in the summer of 2011 to study at the Kodály Institute in Kecscemét. During summer session, he serves as an adjunct professor at Texas State University teaching classes in choral pedagogy, choral literature, and conducting. As an adjudicator, Dr. Arredondo serves as a TMAA member for UIL contests around the state. He has presented, consulted, and been a clinician, at the regional, state, and international levels for music conferences and various school districts. Currently, he serves as director of music and worship arts at the Metropolitan Community Church of Austin and does professional development and mentoring for music educators in Dallas ISD. I am ecstatic to have the opportunity to lead and collaborate with such a talented community of singers. As we embark on a new chapter, I hope that you will continue to attend and support this amazing chorus as we continue to grow and evolve as one of the essential music ensembles of Austin.